Taste test: I think these are kind of overdone. Yeah, I know it says Flavor Rush, but there's just too much seasoning on these. And the really gross thing was the big lump of flavoring (no potato, just a clump of flavoring powder) that was in the bag. Another opinion: I couldn't agree more. Whoever at Frito-Lay decided to add more powder to their chips and then call it "Zesty" should be forced to eat 10 of these bags at once. Even the commercial with Mark Messier couldn't get me to finish one of these bags. 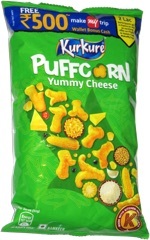 This snack was discovered by Keith and Melissa.